OK-SAFE, Inc. – Well, now for something completely different – a class on drone-hunting. Looks like we are not the only ones irritated by the spy-drones. Iran’s powerful Revolutionary Guards paramilitary units plan to teach drone-hunting to school students, an Iranian newspaper reported Monday. The report by pro-reform Etemad daily quoted Gen. Ali Fazli, acting commander of the Guard’s Basij militia, as saying the new program will be taught as part of a “Defensive Readiness” lesson in high schools from late September. He did not elaborate but the plan suggests students would be taught how to track and bring down drone aircraft by hacking their computer systems. Iran captured a U.S. RQ-170 Sentinel drone in 2011 after it entered Iranian airspace. Since then, Tehran says it has seized more U.S. drones, including a Boeing Co.-designed ScanEagle. Sir William Blackstone & The Common Law, by Robert D. Stacey, Ph.D.
OK-SAFE, Inc. – It is good to actually read a book once in a while; Robert Stacey’s overview of Sir William Blackstone’s Commentaries is one that can be recommended as a worthwhile read. For those interested, the entire text of Blackstone’s Commentaries on the Laws of England can be found on a site call LONANG – short for the Laws Of Nature And Nature’s God. Sir William Blackstone & The Common Law – by Robert D. Stacey, Ph.D. This slim volume provides an overview of Sir William Blackstone’s Commentaries, the common law tradition and the principles of natural law. Chapter 1’s Introduction includes commentary on the culture war. Between liberty and security – “Men are tempted to trade natural rights and liberties in exchange for protection from real or imagined danger.” Stacey goes on to say, “Preservation and security often mean vesting power and authority in the hands of someone – a strongman, a centralized government, etc. – who can do something about the danger. The downside is that the specially empowered authority can often become a danger itself.” (p.25). This is where we are with the drones over U.S. soil, clearly an inappropriate use of the military’s war-fighting surveillance technologies. We have seen evidence of all of the above – i.e. the elimination of the rights of the individual in favor of communitarianism, including the taking of personal property; the elimination of personal privacy and liberty, including the freedom to travel about without being poked, prodded, or surveilled, in favor of “security”; the diminution and denial of God, and the destruction of life and family, in favor of science and technology (the rise of the technocrats). Another way to characterize these tensions? The battle between good and evil. This writer is looking forward to the rest of the book. 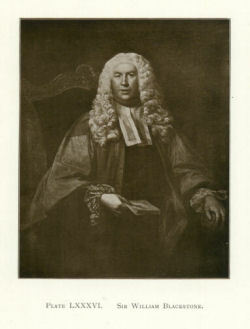 Sir William Blackstone & The Common Law, by Robert D. Stacey, Ph.D. is available here.